Silver Magazine, review of auctions, exhibitions, and shows, book reviews, opinions from curators to silversmith. 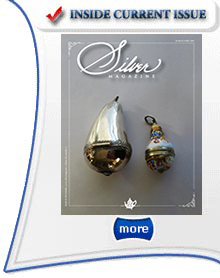 Silver Magazine is the only publication specializing in the width and depth of the silver world. It is a must for the collector, dealer, curator, and casual aficionado. We bring you all the best silver offerings and the finest in research pertinent to the world of silver. We combine features on antique English, Continental and Colonial American silver through and including 21st century silver works. In the pages of Silver Magazine, there are previews and reviews of auctions, information on exhibitions and shows around the nation and the globe, book reviews, opinions from curators to silversmith, letters to the editor, short stories on exciting discoveries, classified and display advertising from the nation's and world's leading dealers, auction houses and museums. Widely deemed to be critical reference material by collectors and researchers, Silver Magazine counts among its subscribers the major museums, galleries, and libraries of North America and Europe. If you are curious or serious about silver, you should be reading Silver Magazine!